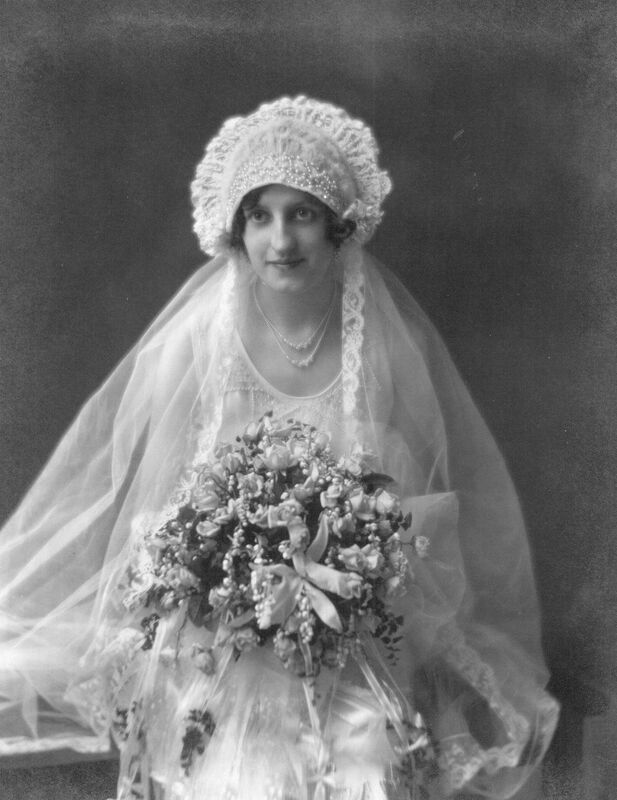 Eva got married in her lovely Charleston wedding gown sewn by a local woman named Tillie. The bridesmaids’ dresses were pink, though that doesn’t show up in black-and-white photos. A huge banquet table set up in the basement was loaded with chicken, kielbasa, bread and traditional Lithuanian wedding fare, including (probably kugelis) and many homemade sweets. When the wedding cake was delivered, the baker had made a mistake and sent a very small cake. Eva cried and cried. A while later, a new, beautiful and VERY large cake arrived as a replacement. 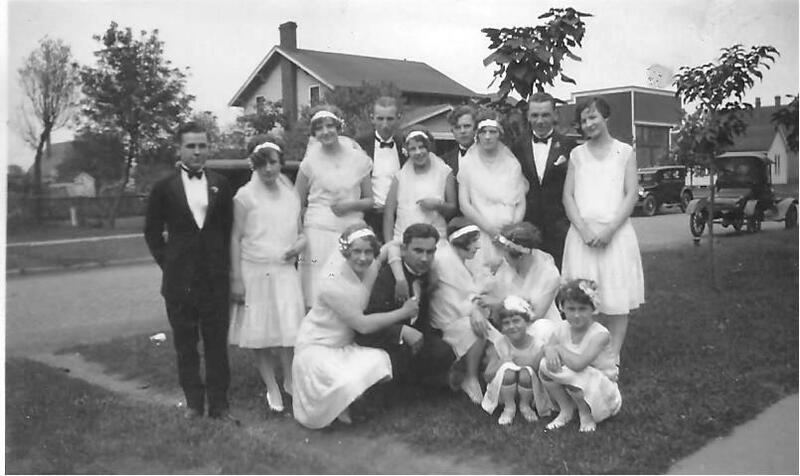 The Wedding Party; notice Kasawich home in left background and model T on right. Upstairs in the living room, there were three musicians: a concertina player, a fiddler (and Eva couldn’t recall what the third instrument was). The carpet was rolled back and there was dancing. A lot of polka music was played. 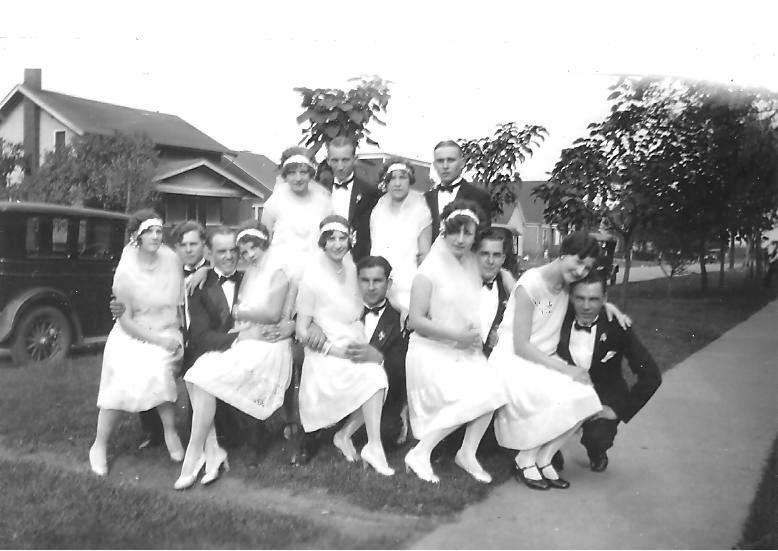 The bridegroom, Victor Alane, loved to polka and danced any chance he got, even after he was old and his knees were arthritic. Homemade beer was served (we can assume, barrels of it, over three days). It was made in the attic of Eva’s home by her mother Anna. Though Prohibition was in full swing, some whiskey called Old Mule also was served. The company that supplied bread to the Kasawich grocery store donated all of the bread for the reception. All the rest of the food, except for the wedding cake, was prepared at the bride’s home by her mother and older sister (both named Anna) and teams of neighborhood women. It took them two days in the backyard just to butcher and clean the chickens. When the bridegroom arrived at the reception with his bride after the wedding ceremony, some of the guests blocked the door and wouldn’t let them in until Victor paid them. (I don’t have any more details about this custom.) However, by the time Victor left the reception after three days of feasting and cracking plates with guests’ silver dollars to win the dollars, the huge bag of silver dollars he carried off to the bank was so heavy he could barely lift it. Corner grocery store / tavern of Anna Leschinsky Kasawich. I think the photo at right is from the early 1990’s. The bigger home two doors down on the left of the tavern/store is, I believe, where the wedding reception took place. The home attached and just to the leff of the store was the Kasawich family’s original home and was used in later years by other relatives until they could afford a home of their own. The little house way in the back on the right of the store also belonged to the Kasawiches, and Eva’s sister, Anna, lived there for many years. 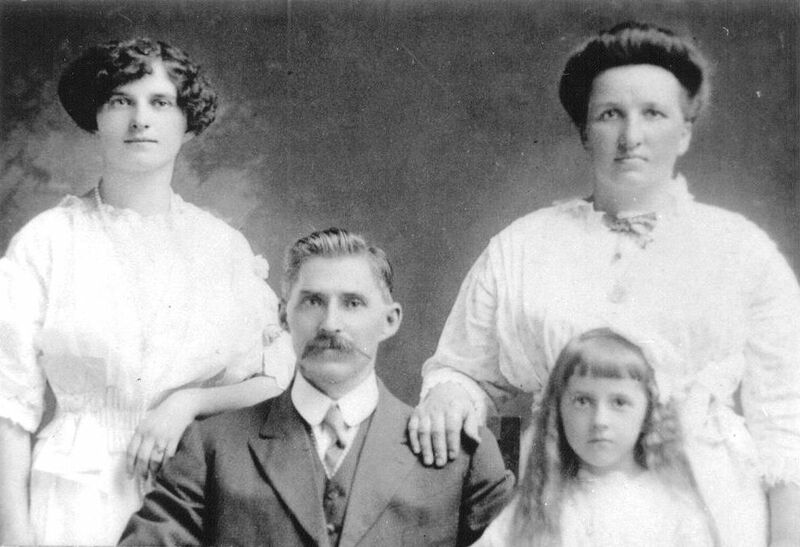 After Eva went off into her new married life, her mother Anna and older sister Anna continued to run the store for many years. This is so priceless! Thank you for this amazing story! The store and home from this post is at the corner of 17th and Reynolds, not 19th and Reynolds. I grew up in the neighborhood and am very familiar with this corner. The structures still stand. Margi, I’ll let the Alanes know what you said. My information is from them, but it is possible they are mistaken since they’ve been living in Wisconsin for so many years. 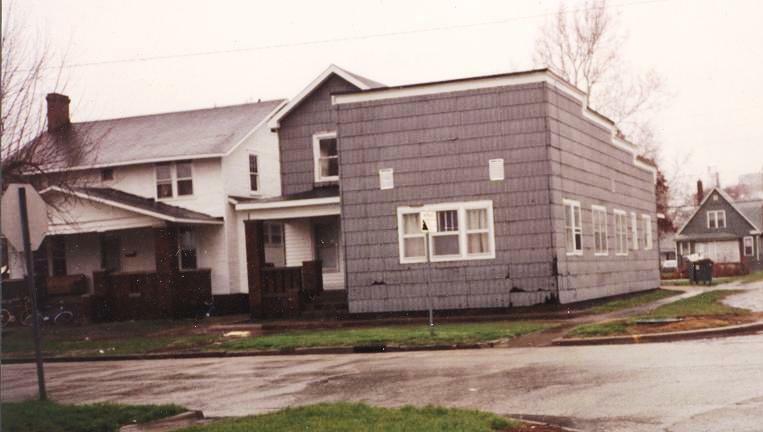 My Lithuanian grandparents lived on Reynolds in the 2nd house on the NW corner from 17th Street. My Dad & his brother & sister went to Hay Edwards Grade School.